By now, you probably know I am a big fan of pizza. Not only do I have aspirations to open my own pizza and wine bar someday, but I make it at home all the time. So, you can imagine we go through our fair share of pizza recipes — tried and trusted, beloved and new — and we remember the good ones. Wouldn’t you? This Chicken Marinara recipe comes from back in the day when Dustin and I were really getting into making our own homemade pizzas. Though it sounded weird to me to combine mozzarella and cheddar on a pizza, Dustin assured me it would be tasty. And it was. The combination of the different flavors, along with the tangy marinara sauce and the sliced, seasoned chicken is so good. It has become our fall-back tasty, easy pizza recipe over the years. Try this non-traditional Chicken Marinara Pizza to change things up! Heat a medium skillet over medium-high heat and add oil. Generously season the chicken with kosher salt and ground black pepper and place in skillet. Cook each side until browned nicely, covering the skillet if necessary with a cover to cook chicken all the way through. When cooked, remove from heat and let set to cool for about 5-10 minutes. Once cooled, slice bite-size pieces of chicken to be spread over the pizza. Set aside. Spread the tomato sauce over the pizza dough, leaving about 1/2 inch around the outside edge for the crust. Sprinkle sauce with oregano, basil, thyme, salt and pepper. Arrange the sliced chicken over the spices and tomato sauce. 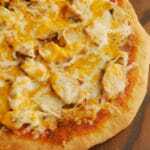 Sprinkle the grated mozzarella and cheddar over the chicken and evenly across the pizza. Place the pizza into the oven and bake for 8 to 10 minutes or until the crust edges are golden and the cheese is melted. After taking the pizza out of the oven, allow it to cool for a few minutes so that the cheese has time to set. Slice pizza and serve. Great recipe 🙂 We totally need to make this again and maybe turn it into a video too. I love your blog and I visit all the time Lacey. It is such a feel good, yummy type blog! This pizza looks so delicious!